Today’s census data show that, despite a growing economy, everyday families are being left behind. While median household income rose modestly in 2017 by 1.8 percent, this represents a significant slowdown from the much larger increases in 2016 (3.1 percent) and 2015 (5.1 percent). Meanwhile, many workers saw economic progress stall in the first year of the Trump administration. In fact, earnings for full-time, year-round working men and women declined overall in 2017. While the U.S. poverty rate declined modestly in 2017, the total number of people facing poverty was unchanged. Meanwhile, the number of people with bachelor’s degrees or higher facing poverty rose in 2017, underscoring the fact that a college education isn’t enough to protect someone from hardship—even in a strong economy. Additionally, nearly half of people living in poverty in the United States are now in deep poverty—below 50 percent of the poverty threshold, or $12,430 per year for a family of four in 2017—marking an increase from 2016. Notably, black and Asian American households did not share in 2017’s modest income gains. This unravels recent years’ progress in closing the black-white income gap. The gender pay gap remains stubbornly unchanged as well. Median earnings for women who worked full time, year round in 2017 were more than $10,000 less than their male counterparts, with women still earning just 80 cents for every dollar a man earns—unchanged from last year. Meanwhile, after years of progress, the share of Americans without health insurance stalled at 8.8 percent last year, as the Trump administration began its efforts to sabotage the Affordable Care Act. And the report made clear how state leaders across the country have made policy choices that keep millions uninsured: The uninsured rate in states that expanded Medicaid was 6.5 percent in 2017—close to half the uninsured rate in nonexpansion states, which was 12.2 percent. 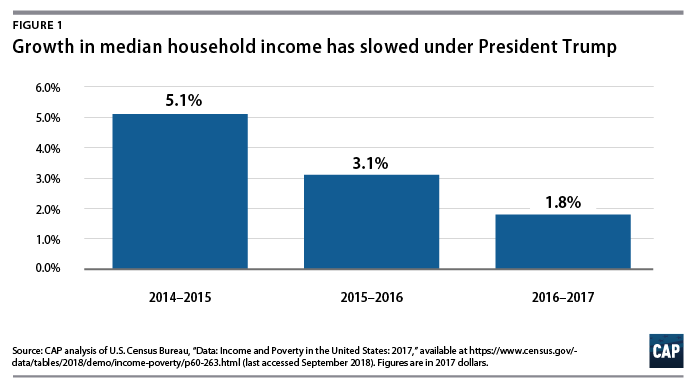 Everyday Americans’ continued struggles in the Trump economy stand in stark contrast to the extraordinary income growth enjoyed by the wealthiest few. For example, the richest 95th percentile of households, those with incomes of $237,000 per year, saw their incomes grow by nearly $7,000 in 2017—eclipsing the modest gains for low- and middle-income households. Meanwhile, wealthy corporations and the ultra-rich are only getting richer thanks to President Trump’s deeply regressive tax law that took effect this year, the impacts of which aren’t captured by these 2017 data. The sad irony is that this administration continues to push an agenda that would only exacerbate poverty and hardship and further stack the deck against working people. Whether through his support of a farm bill that would take away food assistance from 2 million Americans or his administration’s greenlighting of draconian Medicaid cuts at the state level or his proposals for additional tax cuts favoring the wealthy combined with cuts to programs that benefit everyone else, President Trump is undermining the basic supports that Americans turn to when times are tough, while lining the pockets of his millionaire and billionaire friends. For more information or to speak to an expert contact Julia Cusick at ‮g​r​o​.​s​s​e​r​g​o​r​p​n​a​c​i​r​e​m​a​&commat;​k​c​i​s​u​c​j‭ or 202-495-3682.